Hillary beats Barack in Pennsylvania, and the race goes on! We pitch forward at our desk and hit the surface with a thud -- God, when will it be over? Read on, dear friends, and see how we try to acknowledge there's other news in the world beyond the Democratic primaries. The beginnings of a global rice shortage and resulting overseas food riots are causing knee-jerk hoarding on American shores, with Costco limiting the amount of rice customers can buy per visit. Editors, who can smell your fear, will make rice a main course on the front page menu in the days to come. Isn't it tragic that we want something most when it becomes scarce? Now why doesn't this apply, say, to literacy? My, how quickly the zeitgeist changes! Hill barely gets one cheek back on the Sofa of Safety, and suddenly O just "can't close the deal!" He "can't win the big states!" We predict all this O-doom won't stick; the hand-wringing over the Democratic Party flame-out will continue to dominate the discussion, accompanied by an obsessive slice-dice-rehash of various and sundry polls. The Queen must admit that O is looking a bit wan -- can't we have another historic speech, please, or another rousing "Yes, We Can" video? He'd better brace himself, because Johnny-boy has an ace up his sleeve. Courtesy of the North Carolina GOP, a scathing anti-Obama ad featuring the notorious Rev. Jeremiah Wright Jr. is set to hit the airwaves next week in some of our most racially retrograde regions. Johnny-boy, by publicly rejecting the ad, has succeeded in building anticipation for it while looking honorable. Credit goes to the National Review for spotting this neat bit of triangulation. We predict the ad gets heavier exposure than the economy-focused anti-McCain ads the DNC is spending $500K to run on national cable. Yes, the Ad Wars are on. FYI, the freshly ubiquitous Rev. Wright has given Bill Moyers his first post-scandal television interview, which airs tonight. Other pratfalls await Obama. By winning Pennsylvania handily, Hillary has changed the conversation on the nomination fight for the coming weeks. Winning on points is now irrelevant; electability is the measure of success. So says Rep. Steny Hoyer, and some superdelegates will adopt the same outlook. Next week, the Dept. of Veterans Affairs kicks off an ambitious program to phone 570,000 Iraq and Afghanistan war vets. Why? To make sure they're taking full advantage of the range of services available to them... such as they are. Given the sorry state of the V.A. the last couple of years, expect a fresh round of horror stories. Ignore the TR at your peril! A few weeks back we mentioned how few in the press picked up on Admiral Fallon's resignation from Middle East Central Command over Iran policy. But no one's asleep at the wheel this time. The President's favorite general, David Petraeus, will now take over Fallon's old stomping grounds. Is it quid pro quo for his accommodating help in making the administration's Iraq policy digestable? Perhaps, but we're more concerned about what it could mean if Bush gets legacy-happy and decides to level Iran. The New York Times landed a devastating left hook to cable TV last Sunday. The Gray Lady reported that many of the "independent" military advisers regularly invited onto panel shows are Pentagon plants whose purpose is to disseminate administration-friendly talking points through the mainstream media. Pair this with the steep decline in war coverage across the board, and it looks like the Iraq War has virtually become a big cover-up. Nervous TV execs hope the story goes away fast. Rupert Murdoch has put the moves on Newsday, offering to buy the Long Island-based paper for $580 million. The Chicago Tribune has until next week to match the offer. 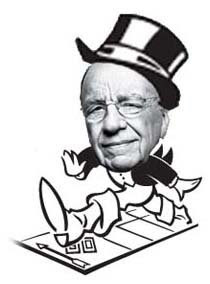 Otherwise, Murdoch's media Mordor, motivated by ka-ching rather than by public service, will soon cast its shadow over two television stations and three newspapers in the lucrative New York market. So much for media diversity for the sake of a well-informed democracy. Where are the anti-consolidation advocates in this time of need? Speaking of Murdoch, farewell WSJ managing editor Marcus Brauchli. You'll probably be better off now, but the paper won't. We may soon be saying goodbye to some New York Times staffers too. Well, once professional journalists have all entirely disappeared, the White House briefing room can be turned back into a swimming pool! We thought we had spotted the latest issue of The Onion the other day when we saw the headline "Pope waves to gay Catholics" followed by the subhead "Dignity members claim 'we got our message across.'" In fact, it was The Washington Blade, the freebie lesbian/gay weekly, in a deadpan display of wry humor. 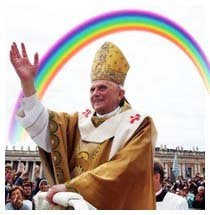 According to the story, during his D.C. visit Pope Benedict XVI waved from the Popemobile as he passed people whose banner identified them as members of Dignity, the organization of LGBT Catholics. Though it's hard to imagine the octogenarian Pope could make out the fine print on the banner -- the part that includes the LGBT words -- from the moving Popemobile, it's harder still to imagine that he intended his wave as any kind of affirmation of Dignity's admirable goals of inclusion in the church or equality in society -- after all, this IS Joseph Ratzinger in a new hat. But without hope, where would we be? This week, GOP Senators successfully blocked the Lilly Ledbetter Fair Pay Act, a piece of legislation that's been under the radar and gaining momentum for nearly a year. Pay equity has always been a top priority for the women's lobby, so expect feminists to come down hard on McCain and the other Republicans who prevented a vote from even taking place. At TR Central, we're ready to start hurling eggs. But forget lobbying Congress. 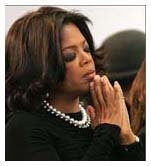 Petitioning Oprah is how you get real results. A pair of Connecticut high school students launched a yearlong campaign to get their favorite band, the Jonas Brothers, on Oprah's show. But this wasn't your typical case of fan fervor. These girls championed their cause in a hyper-organized Internet campaign that included a frequently-updated YouTube video blog, an online petition, and several e-mail-writing campaigns. In the end they won and got to visit Oprah and bask in her blinding fabulousness. Now let's get these girls working on universal health care, stat! In our continuing quest to ensure that TR readers have the best bookmarks and RSS feeds anywhere, we refer you to the recently announced finalists for the 2008 EPpy Awards for the best media-affiliated internet services, presented by Editor & Publisher and Mediaweek. Congrats to the folks who toil away over hot keyboards to bring you those sites. Finally we know who is to replace Conan O'Brien on Late Night when the red-haired wunderkind moves to The Tonight Show after Leno's forced retirement next year. And the winner is -- Jimmy Fallon!? You've got to be kidding. If he makes it through his first monologue without cracking up on camera, drinks are on us! Conan gets the last word: "President Bush made a special taped appearance on the game show 'Deal or No Deal.' Afterwards, Bush said, 'I like this show, because randomly pointing at boxes is how I make decisions, too.'" Oh dear, it's too believable to be funny. While we didn't do much predicting last week, what we did anticipate came to pass. Especially with the major movers and shakers in the blogosphere on the Ben Stein film. Have a great weekend everybody!